If I had to pick just one book to read from chapter 1 of Lizzie Skurnick’s Shelf Discovery, it was going to be A Wrinkle in Time by Madeleine L’Engle. I remember checking this book out of the Evening Street Elementary School library, and the librarian telling me she didn’t think I was old enough to read it. And from there it stands in my memory as the first of my favorite books. The rhythms and plot points of the book had blurred over time, but re-reading felt like getting on a bicycle, or catching up with an old friend–the balance never left. A few things that struck me reading this as an adult: Charles Wallace would have been evaluated for autism/Asperger’s by the time he was five in this day and age. It’s hard to read IT just as ‘it’ now, and not as EYE TEE (information technology). And, wow, the climax of the novel is on page 253, and it ends three pages later. A denouement would have been really nice. Still, I loved this book then, and now love it again. It is physically hard to restrain myself from going off to read A Wind in the Door and A Swiftly Tilting Planet. This entry was posted on Monday, June 11th, 2012 at 12:02 am	and is filed under 2012 Books, Summer of Shelf Discovery. You can follow any responses to this entry through the RSS 2.0 feed. Both comments and pings are currently closed. Heh. This was a DNF for me. I’ll blog about it later today. Oh, Meg. I loved Meg. I love Meg. And Calvin. And the Mrs.s and Meg’s mom and Charles Wallace. I thought her dad was kind of stupid ;), but how I loved Meg. This remains one of my all time favorite books. On Russ’s recommendation (who picked up Shelf Life and may chime in at some point), I picked up Where You Reach Me, and fell asleep trying to read it by today (I’m 96% finished!). It spins off a girl who loves WIT and whose friend may have been saved by a time traveling person. I sort of wished for more of the mystery, but the ending was certainly satisfying. I liked Where You Reach Me, but found it a little thin. Good, but not great. We tried this with the boys recently and it was a non-starter. M_ wondered when, if ever, the plot would get going. I think they gave up after a chapter or two. Maybe we should wait longer and offer it up again? Jack, I’d say to wait, but I’m hearing a lot of non love for it from people who didn’t read it as a child–I think the early imprint of some of these means a lot. I did not read this as a child but picked it up a few years ago and read it for the first time with my then 8 or 9 year old son. I loved Meg from the beginning. This time I did not “read” the book. The three of us listened to this driving from one activity to another and often found ourselves late because we were sitting in the parked vehicle waiting for one particularly great part to end. Maybe I loved Meg so much because I was Meg … that passage could have described me at about 11 or 12. I also read Danny and realized I am just not a Roald Dahl fan. Haven’t liked anything he has written. For extra credit, I thumbed through Narnia and realized my favorite heroine has to be Lucy Pevensie. I actually found a few similarities there … a higher power at work, prettier family member, sorrow and loss, extreme loyalty, and courage in the face of danger. Lucy even manages to save her too proud brother from danger. Patricia, I’ve not yet loved Dahl, either–I found James and the Giant Peach really, really creepy. But I loved Wes Anderson’s Fantastic Mr. Fox, so I haven’t given up hope, though I don’t think I’m going to make it through Danny. You’re right about similarities between Meg and Lucy–I suspect L’Engle was a Lewis fan. I read this book a few years ago, as an adult, and thoroughly enjoyed it. I read the Hunger Games this week, at the urging of my twelve year old daughter, and was amazed at the number of similarities in broad plot points and the heroines’ Meg and Katniss. I plan to use this to encourage my daughter to now read A wrinkle in Time. Lori, I hadn’t thought about the similarities, but they are there. If you want tons more similarities, check out Thomas Hardy’s Far from the Madding Crowd. Far From the Madding Crowd? I must know what similarities you are referring to! I read that book in high school but barely remember it. 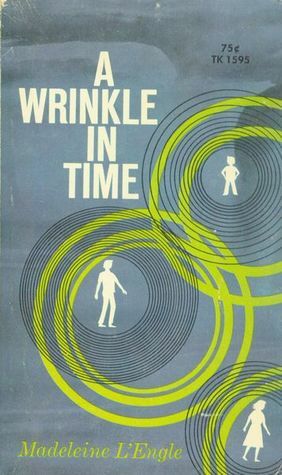 A Wrinkle in Time I also read in fourth grade. What has stayed with me is Meg. A line I still remember after all these years is Meg referring to herself as “the snaggle-toothed, the myopic.” Wondering that anyone might be impressed by her. That line broke my heart at the time, and still does. Lovely book, but the final one was my favorite of the trilogy. Swiftly Tilting Planet? I have fond memories of all. But then, there was at least one that came after, Swift Waters with the twins, that I didn’t care for. I’ve at least liked every Madeleine L’Engle book I’ve ever read, some more than others. I re-read Wrinkle in Time last year, and although it felt short and sort of, well, juvenile, to me this last time, I still liked it. I agree that the ending is a little rushed.